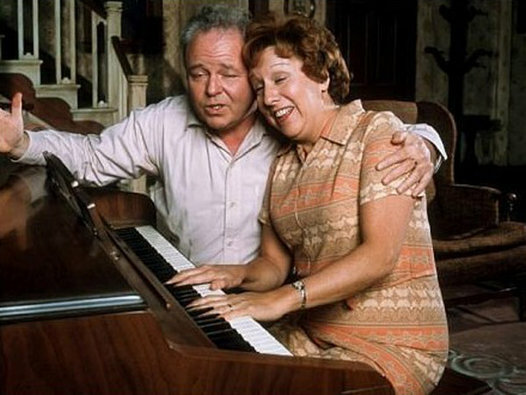 Actually Edith (Mrs. Archie Bunker) faded away with the end of All in the Family in 1979. The actor who played her, Jean Stapleton passed away May 31, 2013 – she was 90 years old! Edith Bunker reminds me of people from my own family. She has become a cultural archetype that at the time we made fun of, but now so many of us yearn for with deep regret. She represents marriage and family in so many ways. Today we look around us and wonder how we have drifted so far. The problem with marriage is that it’s become an uncertain practice left more and more to individual whims and tastes and detached from meaningful social anchors. We don’t invent meaning all by ourselves, it is socially constructed through interaction with our families, friends, schools, churches and groups. When we become free-lance relationship entrepreneurs we are alone casting about trying to find another lonely soul who wants to huddle under the bridge to wait out the storm. We’ve taken “have it your way” to its disastrous conclusion. Our (all of us) basic social needs are no longer being met by what we once called marriage and family. The median age at which people get married has been rising – we’re waiting longer to get married. Most young singles in America (18-29) do not describe themselves as actively looking for romantic partners. Huh? Even those who are seeking relationships are not dating frequently. About half (49%) had been on no more than one date in the previous three months. What? One third of all American children grow up in a home without their father. A majority believe that single-parenthood is not good for parents or children, yet only a minority feel that trends in this direction are a mistake??? help lower insurance rates for all of us! I’m now beginning to wonder if the institution of marriage here in the west is now experiencing deinstitutionalization. Marriage and family are so critical to our entire society that long ago we institutionalized our beliefs and practices surrounding it. We made these as permanent as we could and then we socialized everyone to believe in and desire them. We created rituals to embody marriage and family with social significance and we developed rites of passage to move young people into adult roles which included marriage and establishing families. People aren’t getting married today because they don’t know how. As the institution falls apart its essential functions become less certain. Ask a college student to tell you what todays rules are about dating. You’ll probably get a blank stare. Sexual Liberty – medical advances allow all members of our society (even children) to engage in unrestricted sexual behavior. Social norms have followed these advances. Sexual behavior is becoming an unregulated experience – marriage and family once regulated sexual behavior. I’m not so much describing what people do and have always done, instead I want to draw attention to the destigmatization of unregulated sexual behavior. “Career Fear” – Since the 1970’s our economy has been so uncertain that we are driven by more fear and less hope when preparing to enter the workforce. Are we getting the right specialized training in college? Is graduate school where I need to go next to advance my marketability? What kinds of uber-competitive social skills do I need to develop in order to survive in the brutal world of work? Marriage and family dreams fade away as the immediacy of building your working-self drives your emotional engine. You can only imagine how much more difficult this is for segments of our population that are uneducated or under-education – BTW, these populations are getting married at lower rates than anyone else! Inner-Directed Happiness – several social researchers have pointed out that post-WWII America began to look for happiness in a different place. At one time we found most of our contentment in the many ways we provided for others. We were happy because we had made meaningful contributions as family members, citizens and employees. Happiness was socially defined. As “post-modern” approached and we surveyed all of the success around us, we began to turn inward. Happiness became individually defined and internally experienced. Relationships were based on answers to questions like, what does this do for me? Self-fulfillment became the nagging inner voice that made us question all our decisions. There’s nothing wrong with being happy, but at what cost? Despite all of the radical change at that time, Edith Bunker was a high pitched reminder that some things never change – like a wife’s devotion to her husband (and vice versa) and the hundreds of ways that family and home are a safe refuge. I’m not sure that was Norman Lear’s primary objective. Each time Archie came home from work, Edith came tearing out of the kitchen with a cold beer can in her hand ready to greet him and seat him in his worn out throne in front of the television. A ritual that reminded all of us of a permanence we thought would always last. Norman Lear revolutionized television using the American family as a platform to talk about the most pressing social issues facing our country during a very tumultuous time in history. Today we need someone to draw our collective attention to the incremental disintegration of something essential to our survival.